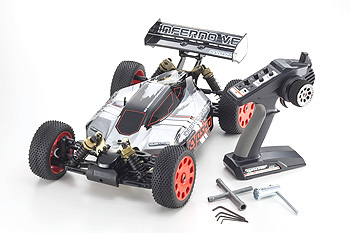 Power and acceleration tests the bounds of common sense in a buggy that also features nimble control ! 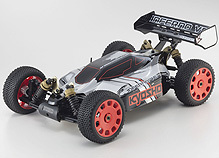 Shares the same stylish gun metallic anodized finish aluminum parts as Kyosho’s flagship “Inferno MP9”. 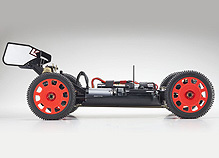 Team ORION NEON8 brushless motor delivers powerful acceleration. 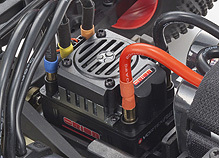 2-piece motor mount allows easy backlash adjustment and removal of motor. 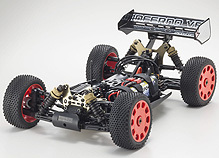 Team ORION VORTEX R8 ESC with electric cooling fan features a 12-item program that allows precision adjustments such as brake, timing advance, cutoff voltage and heat protection. Large Big Bore resin oil shocks produce excellent surface tracing. 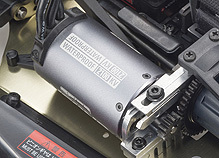 High-strength aluminum shock stays deliver full shock absorber performance. 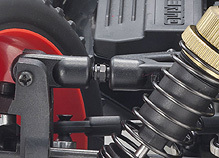 Turnbuckle upper arms and steering tie rod can be adjusted to optimize alignment setting to running conditions. 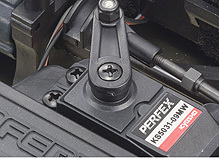 Included high-torque (KS5031-09MW) steering servo delivers nimble control feel. 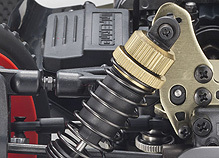 Features built-in high durability metal gears. Lowered chassis height in combination with optimal weight balance and big bore shocks realizes high stability running performance. 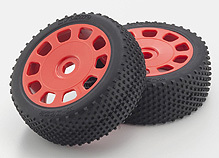 Square block pattern tires provide ultra high grip and combine with high visibility neon red dish wheels. High visibility printed body is designed for airborne stability and control and is also pre-cut with decals applied.